This annotation previously appeared in Senses of Cinema, no. 20, May–June 2002, and in Senses of Cinema, no. 6, May 2000. There is a scene in Come and See in which the lead character (Florya) returns to his family’s village in the expectation of a warm and comforting greeting. Everything is still and abandoned, flies buzz incessantly on the soundtrack, dolls lay abandoned mid-play on the floor. At each turn we expect for him to discover some horror, to have this brief moment of tranquillity broken by the uncovering of slaughter, a body, something horrible at the bottom of the well. Suddenly, and this is a film full of histrionic shifts and turns, the character becomes possessed by the idea that his family is in fact hiding on an island in the middle of a nearby swamp. As he runs pell-mell towards this ‘refuge’, the woman he is journeying with looks back – a strangled scream spills from her mouth as she sees, roughly piled against the side of a building, perhaps a barn, the naked bodies of the teenage boy’s family and many other inhabitants of the village. 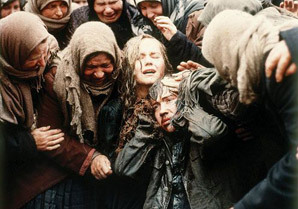 This intense sequence, full of revealing close-ups and revelatory camera movements, encapsulates many of the strongest qualities of Elem Klimov’s film, in particular its ability to shift tone, visual perspective and viscerally approximate the physical, mental, social and cultural conditions of life in Nazi-occupied Byelorussia in 1943. The young woman’s look back at this image of horror, almost Biblical or medieval in its intensity and scale, rhymes with many other looks, gazes and shifts of scale and perspective which dot and define the film. Come and See opens ominously with a scene involving two young boys agonisingly prying from the Russian soil a rifle buried alongside the remnants of its owner. As finally one of the boys frees his weapon and waves it triumphantly in the air, a German reconnaissance plane buzzes overhead, and our perspective on events shifts as we are taken up to the position of the aircraft looking down on what now seems a less auspicious and circumspect achievement. Although Come and See predominantly follows the rites-of-passage journey of its young, but quickly and visibly aging protagonist, it is remarkable in its ability to shift perspectives, sides and to gain access to the subjective and objectives states of a wide range of characters and objects. Like Terrence Malick, Klimov is as much interested in the landscape, light, colour and other non-human occupants of the environment as he is in representing the minutiae and widening horror of the character’s journey from home to the multiple sites of slaughter, genocide and betrayal that mark the countryside. For example, in one of the films most remarkable and surreal scenes several characters are shown guiding a cow across what seems to be open and unguarded terrain. All of a sudden a series of intense firefights break out. Several characters are killed but it is the fate of the cow with which the film is most preoccupied and to which it grants the most screen time. The images of the cow standing untouched by the raging skirmish, then struck by a barrage of tracer bullets, and finally of its eyes rapidly shifting and dilating before death, are indicative of Come and See’s ability to produce indelible images, and carve remarkable audio-visual statements from what are often quite standard war film situations and stereotypes. The journey of a wide-eyed innocent across a fallen landscape is common territory for the war film, but like Kon Ichikawa’s The Burmese Harp (1956) and even Andrei Tarkovsky’s Ivan’s Childhood (1962), Come and See enlivens and enriches the form (one of the dominants of Soviet cinema) through the iconoclasm and intensity of many of its images. A defining image of many war films is that of the close-up maddened war-face or the vacant stare of a character who has seen too much too quickly and in much too much graphic detail. Come and See also builds to such an image but in a manner that breaks from convention. Rather than wait for this final pay-off the film is dominated throughout by the faces of characters, and the terror of war is largely documented through a litany of looks, gazes and incongruous stares. Come and See is also remarkable for its attenuated use of what in other hands might have become quite abstract and removed elements, such as colour and sound. This is not in essence a realist film, its greatest shocks and effects are produced by the nightmarish pilling of horror upon horror, the mutedness (all greys, greens, browns and musty yellows) of its burnished cinematography, the extraordinary close-ups of several of the characters impossibly aged faces, the hyper-expressive performances of many of its actors (particularly those playing German characters and Byelorussian collaborators), and the impressionistic and at times almost expressionistic use of subjective sound. In the context of this, the title of the film is not just an entreaty for the audience to bear witness, to ‘see’ that which is not imaginable, that which has little visual record, and to get a sense of the physical conditions (the ‘come’ of the title) experienced by those who tread this bleak battleground and frontier (though it is very much a record of actual events), but a description or pointer towards the material conditions, qualities and spectatorial expectations of the film. Come and See is set in Byelorussia in 1943 and provides testimony to the brutality of the Nazi invasion, the collaboration of some of the inhabitants, and the widespread genocide and destruction perpetrated upon those who lived in this occupied territory. The film’s most sustained sequence revolves around the raising of one village and the slaughter of most of its inhabitants. This sequence has a disturbing carnival-esque quality, its images and sounds used to promote the depravity of the occupying ‘master-race’. The film is essentially an epic journey and many of its images possess an almost Dantesque quality (with a tough of Bruegel). It can also be seen as a ‘coming of age’ film, a remarkable ‘coming’ or progression (or is it regression?) that is etched upon the utterly transformed face of its central character. The film is in many ways a documentation of this face. Florya starts the film as a fresh-faced youngster eager to join the partisans and fight the brutal occupation force. Initially he sees out into the world, understands the commitment he makes, and the role he thinks he is going to play. Rather than play that role of the active protagonist, the war hero, the liberator of an occupied terrain, he is forced to witness, see and hear the horrors and atrocities around him. This is emphasised by his forced passivity throughout much of the film (he never gets to fire his rifle). Things seem to happen around him as he is spared more by happenstance than courage or good fortune. It is in response to the film’s next to final images that one must ask whether he is lucky or damned to have survived, whether he is turned sage or mute by the experiential images and sounds that have transformed him. At this moment we are shown a face that looks out but is no longer able to see those who glance or stare back. A face that no longer has the ability to see in the same way, and that no longer is able to take in any more images. The age, lines and wear we see in the face is the sum total of the horrors he and we have witnessed in the film. As we sit pondering these questions and those faces, the film cuts to a wood. We follow the partisans as the camera glides through the trees. The beautiful strains of Mozart appear on the soundtrack, the camera looks up to glimpse the light beyond the tops of the trees. This moment is many ways constructed to achieve that most rarefied of effects, an epiphany, and yet the film has warned us to never take such moments, such combinations (of image and sound), or such striking images on face value. It subsequently emerges as one of the most troubling and uncertain moments of beauty and tranquillity in all of cinema.